RoyalEnfields.com: Is a Royal Enfield up to the Going-to-the-Sun Road? Is a Royal Enfield up to the Going-to-the-Sun Road? 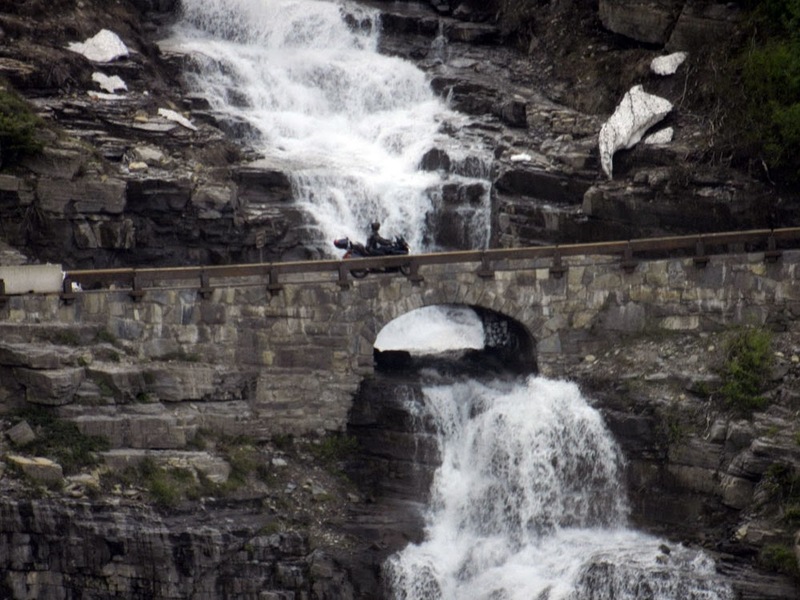 A motorcyclist crosses a waterfall of snow melt on the Going-to-the-Sun Road. 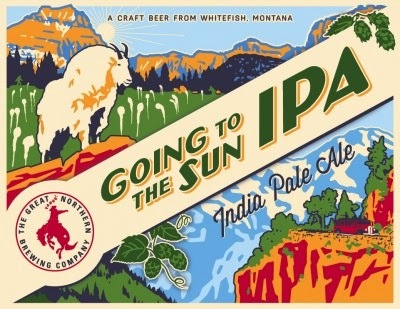 It's a road so great it inspired its own beer: Going to the Sun IPA by The Great Northern Brewing Company, Whitefish, Mont. The beer is a very drinkable India pale ale. The Going-to-the-Sun Road is 50 miles of two-lane twisties across the Continental Divide inside Glacier National Park. This year the National Park Service got enough snow out of the way to open the road in July. The road tops out at Logan Pass, 6,646 feet. That's not high, compared to the Himalayas, but the danger here is avalanche, not altitude. Lives have been lost. One source notes that "there are few guardrails due to heavy snows and the resultant late winter avalanches that have repeatedly destroyed every protective barrier ever constructed." 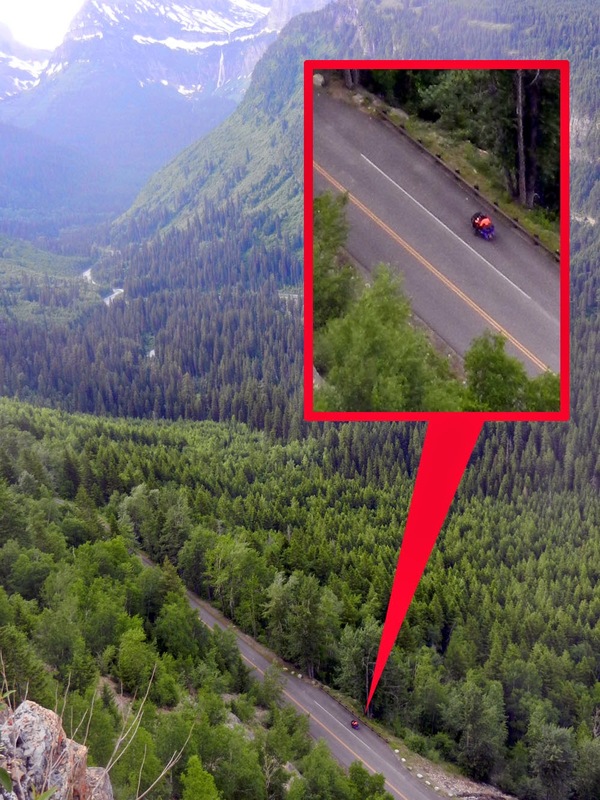 Seen from far above, a motorcyclist makes his way up the road. You may see mountain goats and bighorn sheep on the road. We saw a bear. And, not to my surprise, we saw many motorcyclists. They do love a challenge. Would the Going-to-the-Sun Road be a suitable challenge for my Royal Enfield Bullet? It's pretty steep. I'd probably miss that 17-tooth front sprocket I gave up in favor of an 18. And in July, when we drove the Going-to-the-Sun Road, it was cold! My motorcycle and I are truly best geared for riding in Florida. I was happy to see the remaining snow (and the bear) from inside our rental car. Appropriate artwork on Going to the Sun IPA carton.